Whats the Best Projector Under $100? We've done the research for you. Whats the Best Projector Under $100? We’ve done the research for you. After many hours of in-depth research and immersion, we think the Vankyo Leisure 410 LED Projector is the best buy if you are looking for the best projector under $100. It has above average specs for the units of this class but what tips the balance for this unit 3-year warranty to boot. If you are looking to purchase a cheap projector for outside use, gaming or your home, the Vankyo 410 would be our choice. Many of the projectors in this bracket have specs that are somewhat similar but the Vankyo is generally at the higher end of those specs. At this class of projector what is important is the quality and this projector is an upgrade from the very popular and well-performed Leisure 3. For $100 you are not going to get the best quality projector, so the thing that really seals the deal with this one is the fact it comes with a 3-year warranty. Most of the other units we looked at come with a 1 or 2-year warranty. I think if you got 3 years of solid work from any of these units we’d consider it a very good buy, so to be covered for that period is fantastic. There is a lot of information on the internet and it is hard to know who to trust. You have every right to be sceptical of what you read, and really, unless its a website that you trust, you SHOULD be skeptical. Trust is the key word and we understand that’s something you earn. We want to earn your trust, the survival of our site depends on it. The LAST thing we want is for you to visit and never return and in no way, shape or form can we do that by misleading on anything of a deceptive nature. That’s why we put a huge amount of effort into our research and try to bring you the most helpful guide possible. If you do ever find anything to be inaccurate, or you have a superior knowledge on a topic or product, please get in touch as we would love to tap into your knowledge to further help the readers. Hopefully, in time we can gain your trust and you will visit again. Who should get a cheap projector under $100? Personally, each night, in the evening I get home and me and the mrs start arguing about who is going to use the TV. So I set about resolving the issue, but as much as I wanted to, I couldn’t justify spending hundreds or thousands on a brand you awesome TV. I wanted something for my PS4 that was cheap but had a large display area. Remembering the time I stayed at a mates and we jumped in the spa one night when it was raining, and he popped his projector on and we watched the game from the spa drunk some beverages. So I thought, I’ll go on a mission to get a cheap projector. Turns out there are many other people with similar ideas, using theirs for outdoor movie nights, gaming and sometimes presentations. Be aware though, a lot of the featured projectors in this article specifically state they are not designed for presentations, so you might want to search for a presentation specific projector if that’s your purpose. However, if you are looking for a cheap, cost-effective option for the outdoors or indoors, and are not overly fussy on the quality of sound and picture then one of these projectors might be for you. 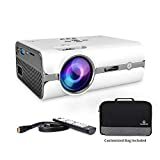 There is aschool of thoughtthat projectors under $300 are going to be junk, sometimes you will be mislead with specs, and recommended to stay with more expensive well-known brands. On the flip side, however, I think most people searching for a projector under $100 are not searching for the Maserati of projectors. It goes without saying that it’s likely the more money you spend the better the quality is going to be. We imagine there are a lot of people like us (probably why you are here) who are just looking for something that does the job and doesn’t cost a bomb. Most of what you are going to get for this price is going to be effectively “cheap Chinese” products, but as proven if you find the right model – with the right expectations you could find something perfect for your needs. Many of the models have speaker systems built in and you will want to set your expectations low as to their quality. Luckily most have a headphone jack of which you can plug in a higher quality speaker system too. Through a process of elimination. We went through the highest rated products on the largest retailers websites and tried balanced the positive feedback with durability. For example, if there were only 5 reviews of a product then we generally tend to avoid it until it becomes a more proven product. Once we had chosen around 10 or so products we sifted through all the reviews of each product along with factoring in the features of the product in order to eliminate some of the products and leave us with around 5 to preview in depth. From there we picked apart every aspect we could to determine which would be the best projector for under $100. Contrast ratiois a big one for choosing a projector. In a way it is what will determine how good your picture will be. The higher the contrast, the clearer the picture – the lower, the flatter and washed out your picture will be. Higher contrast ratio will make your blacks blacker and whites whiter, giving you a more vibrant picture. A quick example of how contrast ratio effects your picture quality. Low contrast ratio will make the image more flat like the image on the right. If you are been looking for a projector you will have come across the term Lumens. In short, lumens are a way of measuring light and you can get a full breakdownhere. What lumens will determine is how much light the projector puts out. If you have a room that is not dark in which you wish to use your projector, then you are going to want a projector with high lumens. As a comparison a 100 watt incandescent light bulb will put out around 1600 lumens and most projectors here, under $100 will put out around 1500-3000 lumens. According to Azcentral.com the difference between 1500 and 2000 lumens will be available and you probably won’t be able to tell the difference much, however 1000 lumens difference there will likely be a noticeable difference. As mentioned though, at this price range you are looking around 1500-3000 lumens. Resolution effectively determines how clear your image will be and whether or not your image will start to pixelate. Just like trying to scale up a small jpeg, doing the same with your projector, beyond its limit, will make your projection pixelated. An over exaggeration of the picture quality you might experience with different resolution projectors. You will find most mini projectors under $100 all comes around a similar level of 1080p. This is something you are more likely to see on more expensive models to but some of our selected projectors do have an element of keystone correction. Keystone correction is what you see if your projector is not perpendicular to the surface you are projecting onto. The image will be skewed. It was tough to find any information on who exactly CamKing are. Branding on the projector also is “Unhappy”. They seemed to have no website and very little information publicly available. They are obviously in the electronics business with a number of other various products such as video cameras, vacuum sealers, mini digital cameras etc. Reviewmetadidn’t seem to like the look of the reviews either but as they mention in their disclaimer it’s not to say this company is not legit and not a good operation. The product seems to have been released in mid-2018. Having said that, lets have a look at the product. As far as specs go this model fares, it sits slightly on the lower end of what you are able to get. Usage hours are stated as 20,000 which is a bit below the other models which sit around 40-50,000. Its image size of 30-130 is slightly smaller again than the other models with some being more around the 30-170 mark. Lumens are stated at 1500 which again is just a bit lower than the 2000-2500 of the other similar models. The feedback on this unit is unanimously positive. And if we are to believe the reviews the customer service team is responsive and does a very good job. Some mentioned the sound being average but we think you should expect that from anything this small and in this price range. From the outside, the feedback looks amazing, but when we dig a little deeper much feedback is from other models and occurs at a somewhat unnatural rate. It looks like a solid choice for the price, but given its slightly lower specs, it might not make the cut given the other quality units available. We’d prefer to wait until there is a lot more feedback. Hausbell, much like CamKing have their fingers in many pies selling everything from home and garden to electronics. Again, like the CamKing above it does tend to be on the slightly lower end when it comes to the specs. Lumens are 1500 wherein other models for this price you can get at least 2500. It does boast that you can watch at up to 220 inches with a clear image but I would image that’s a stretch, especially given projectors with higher lumens don’t even tout that. Everything else comes standard like your VGA, HDMI USB, HD connections along with your LEDs and 16:9 aspect ratio. Another mini projector with great feedback. I can’t mention too much but feedback for this particular unit does not seem natural. Nothing for me on this projector really stands out. The specs are ok, but not great. If you intend to look at this model do your due diligence when it comes to its feedback. Much like the other projector makers Myriann is somewhat hard to find any information on. They have had a presence in Aliexpress and have so for around a year and their feedback is high which is somewhat encouraging. Their website link on their Facebook page, however, does not work so it is hard to get a read on who they are as a company. The projector itself seems to have been made available since August 2018 so is quite a new product. In regards to features, it really comes with standard features. 1080p, 33-170 size, LED lighting, 30,000 runtime, AV / VGA / USB / SD / HDMI connections. It does however not state lumens which is a crucial element in choosing a projector. It is said to feature a ‘mega bass subwoofer’ however we cannot imagine at this size, and price range that will make a whole lot of difference to the sound. If you are a perfectionist in regards to your sound you will definitely be using external speakers anyhow. Currently, the feedback is all positive, but with only a little feedback, it is again hard to determine the quality of this unit. Given little information is know about the company, that there are no lumens stated and the fact, at the time of writing there are only a small number of reviews and all are positive, personally I’m still a bit wary. Even though if you are not spending a large amount of money on a projector, It’s still good to know it has an element of performance backed by a number of reviews over a longer period of time. At first look the Vankyo is highly rated by customers. The thing that really drew our attention to this particular unit is the fact that it comes with a 3-year warranty which is the highest out of all the projectors we considered. Given that these units are cheap and likely cheaply made to have 3 years of guarantee really goes a long way. Again though, not much to know about Vankyo as a company. As far as specs go many of these units are comparable, but this unit states as having 2500 lumens which is at the higher end for projectors of this price range. Along with a 40,000 hour lamp time and other specs which are on the higher end this projector fares pretty well spec wise. Although it appears to have a slightly lower rating than some other units, I think a lot of the feedback is genuine and more naturally occurring and the criticisms you would have with other units anyhow. None of these units are going to give you amazing sound. Many talked about the high quality of picture and customer service seemed to be responsive. Also, some used the unit for powerpoint presentations which is specifically stated, is not what the unit is for. The fact this unit offers a 3-year warranty is probably what sets this apart from the other units. Along with its above average specs and the fact most of the negatives about this unit are negatives you will likely get with other units makes us lean heavily towards this being a top choice. Another highly rated projector by customers in the AuKing Mini Projector. This unit comes with a 2-year warranty which is less than the Vankyo, but more than the other units. Specs wise, this is again on the higher end for of the units compared with 2400 lumens and 55,000 lamp hours. This is slightly fewer lumens, but more amp hours than the Vankyo, though one can’t imagine a unit like this lasting 10 years for a number of various reason. Like the other units, it has all the inputs you will need with Amazon Fire TV Stick HDMI, VGA, USB, AV, Laptop and Smartphone compatibility. Unlike a than Vankyo, this doesn’t have adjustments for the picture on the unit and you need to move the projector closer or further away manually. Most feedback is positive but there were a sprinkle of negatives with this unit, such as performance quality and no screen adjustments. We think the performance quality is not quite as good as the Vankyo even though the specs are comparable. Though it does have a 2-year warranty which is nothing to be scoffed at. While we chose what we think are probably the best options, there are a number of other projectors under $100 worth taking a look at depending on your method of choosing. For example, theDR.J (2018 Upgraded) is a best seller and has quite reasonable feedback. It has been on the market a while and has got a lot of feedback so you will get a pretty good idea of the quality. It has comparable specs as the above units and also comes with a 3-year warranty. The Qkk mini projector is another one to look at with very similar specs, if not identical to our preferred choice, Vankyo. With a 3 year warranty and great customer feedback along with a 3-year warranty, it is certainly worth a good look. The Vankyo Leisure 3 is the earlier model to our chosen Vankyo projector. It is a tried and tested model with very much the same specs as its successor.